North Toryglen green space and active travel designs, event Monday 15 April, open on-line until 30 April. Nothing new coming forward that we are aware of. Glasgow, Doune Gardens – fixed, or is it? Renfrewshire, Glasgow Airport Improvement Area, Design and Construct contract awarded. This is one that almost slipped through the net but was rescued from the inbox just in time! As stated in the attached documentation, any person wishing to object to the proposed Order should send details of the grounds for objection in writing to Stephen McDonagh, Neighbourhoods and Sustainability, Exchange House, 231 George Street, Glasgow, G1 1RX or by e-mail to land@glasgow.gov.uk by Friday 19th April 2019. Reason for the proposal: Glasgow City Council proposes to implement a new two-way segregated cycle track on the north side of Craighall Road, linking proposed works on North Canal Bank Street with proposed improvements to the pedestrian and cycle link between Speirs Wharf and Garscube Road. This will incorporate a new signalised junction at Speirs Wharf and Craighall Road, providing a safe environment for pedestrians and cyclists to cross an otherwise busy road. So that’s a lot better isn’t it? But, before you ask, no we haven’t been given sight of the plans for the segregated cycle lane. However, it’s a move in the right direction – best to support it. Here’s the GoBike letter of support. I acknowledge receipt of your email and would like to thank you for taking the time to respond. If you haven’t done so already, and you know this area do please reply before the 22nd. Here are the details. We mentioned this first in our last Digest, Digest 31, Item 1.8. The documents are the Advert, the Plan, the Report and the Statement of Reasons. Thus it is one that we should all support to ensure that the South City Way may be built. The email from the City Council was in our last Digest, Digest 31, and the email address to send responses to is: land@glasgow.gov.uk. The GoBike response will be going in soon. 1.4 North Toryglen green space and active travel designs, Monday 15 April, open on-line until 30 April. https://www.urbanroots.org.uk/workshops/northtoryglen This is a neighbourhood programme of improvement so do please support it if you know the area. The event yesterday was excellent, with attendees ranging from the Traffic and Transportation Engineer from South Lanarkshire Council to young children from the local nursery. The proposals include better cycle and walking access across North Toryglen plus park areas with activity equipment for young and old. It will become far more than a housing scheme with derelict land around it, for more an interesting and desirable place to live and to visit. Here’s one that arrived on paper in some flyers inside our newspaper (yes a paper paper!) and allows the use of my zebra crossing photo again! The survey is being done by the Transport Research Institute of Edinburgh Napier University and Transform Scotland (of which GoBike is a member). It’s an easy survey to do so do please complete it. https://www.smartsurvey.co.uk/s/ClimateChange2019/ so do please complete it. There are lots of ideas in this document so do please put those brain cells to work and tell the City Council what they need to do – and what we, as citizens, need to do. “Thank you very much for making the time to read and respond to the Framework document. I will ensure that your comments are fed into the consultation process. Let’s hope we see the transformation this framework promises. “Thank you for your email. Please accept this in acknowledgement of receipt and please note that we will contact you should further information be required. On Holm Street, around the corner, things aren’t quite so good, with the fence horizontal rather than vertical and, along at the Robertson Street end we still have the part-time contraflow, part-time car park situation. We must, though, be grateful for a wee bit of progress? We have been trying to push the council to make cycling and walking diversions around works policy more effective and hope we will soon reach a status that won’t require us to complain to them about every individual instance before improvements are made. We were euphoric after a meeting with the City Council just before Christmas, see Digest 25, Item 3.4, where we were told that, despite previous denials, there is room on Byres Road for segregated cycle lanes. However, things have slipped; we were told the design would be completed in January with a Traffic Regulation Order following soon after. We heard nothing until then being invited to a Design Workshop, which finally took place on 21 March. but the notes don’t make any reference to the support in the majority for the segregated cycle lanes within the voting, which showed that 3 tables were in support and only 1 in opposition. 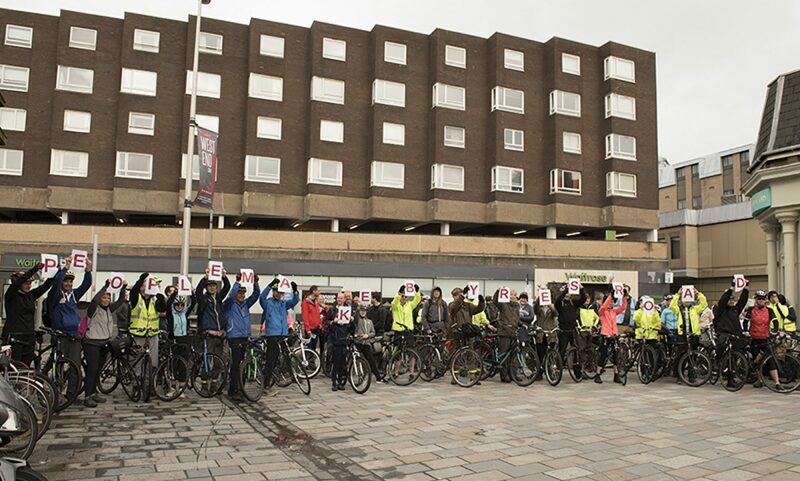 We accept that the voting results are included within the report, however we have seen how evidence can so easily be overlooked when people are asked to give up space for active travel, and that those who oppose it can shout loudest, without necessarily being in the majority. It is therefore really important that the majority support for the segregated cycle lanes shown in the voting is also reiterated within the text. Could you please confirm that the record can be amended to balance this correctly? Another point to make is on the legitimacy of including the question of support for the segregated cycle lanes at all. Being that we agree that the transport hierarchy mandates that space for cycling needs to be included in redevelopment schemes, that question shouldn’t need to be asked at all. We wouldn’t ask “should there be pavements” or “should there be a road”. Let’s hope there is no back-tracking on what we were told in December! There has been NO consultation on the proposals for University Avenue, just the almost final nails in the coffin for what was once a flagship cycle route for the City Council, ie the Colleges Cycle Route linking Glasgow Caledonian University to Glasgow University and then out to the old Strathclyde campus at Jordanhill. See our post of 12 April for our latest update on this sorry tale. Back in February, and reported in Digest 27, Item 1.6 we reported on the proposals for introducing a 20mph speed limit in this area. Back in 2017, Hyndland, Hughenden and Dowanhill West were brought into the city’s restricted parking zones and streets were made one-way to facilitate “legal” parking, but with no exemption for bikes – despite the default position given in Cycling by Design. GoBike submitted this letter supporting the 20mph but deploring the cut in permeability for bikes. Thank you for your support for the above named traffic regulation order. I note your comments reiterating GoBike’s aspirations for one-way roads with exemptions for cycling which was related to the Hyndland, Hughenden and Dowanhill West (Traffic Management and Parking Controls) Order 2019 however, this is unrelated to this Order. As previously advised, once the parking controlled zone and associated 20mph speed limit zone scheme have been introduced and ‘bedded in’ the Council will have a better understanding of the parking demands and associated traffic movements. Any cycling improvements, including one-way except cycles could be considered as part of a future strategic cycling strategy which would require amendments to the existing parking control scheme and would require to undergo the statutory traffic regulation order process. Your support will be considered and included within the final report to the Executive Director of Neighbourhoods and Sustainability. Once a decision has been taken in regards to these proposals I shall write to you again and advise of the outcome. This really does make a mockery of using design guides and having a policy of encouraging active travel. It’s another point to put in your response to the Climate Change survey advertised in Item 1.6 above! “Today I went to the Sauchiehall and other avenues event. A friendly lady from the community engagement company (Icecream, icebox? Something like that) was there and an Engineer from the company doing the streetscape. They had the usual post-it-notes on a street map for feedback on Sauchiehall St. This work should finish “soon” but when I was there zero construction was happening. There was supposed to be a council planner there but he was not there at 1300. I was there for a while, left for a coffee and went back and left again at 14:00 but still was not there. What a shame but then, just what is happening now with Sauchiehall Street? 3.8 Glasgow, Doune Gardens – fixed, or is it? 3.9 Renfrewshire, Glasgow Airport Improvement Area, Design and Construct contract awarded. The design and construction contract for the Glasgow Airport Investment Area project has been approved for awarding to Wills Bros Civil Engineering Limited. Councillors on the Finance, Resources and Customer Services Policy Board approved the £21million construction contract to the Motherwell-based company. The Glasgow Airport Investment Area project is jointly funded by the UK and Scottish Governments through the £1.13billion Glasgow City Region City Deal and will see new roads, bridges, cycleways and footpaths being built to connect into a site at the centre of the emerging Advanced Manufacturing Innovation District Scotland (AMIDS). The construction contract award was also subject to approval of the Full Business Case by the Glasgow City Region Chief Executives Group – this approval was given on the 28 March. Final procurement procedures are now being completed, with construction work set to start this summer and be completed in 2020 on the enabling infrastructure and environmental enhancements underpinning AMIDS – a major innovation district being developed in Renfrewshire. This will improve connections into a 52-hectare site next to Glasgow Airport, which is already confirmed as the location for the National Manufacturing Institute Scotland (NMIS) and the Medicines Manufacturing Innovation Centre (MMIC). The construction work will ensure the site is ready to welcome its new tenants and provide the perfect investment opportunity, focusing on innovation, research and advanced manufacturing. Future development at the innovation district also took a major step forward with the granting of planning permission in principle. Renfrewshire Council’s Communities, Housing & Planning Policy Board approved an application for planning permission in principle on 26 March 2019. The planning permission in principle addresses common planning, environmental and statutory requirements for the land and establishes the appropriateness of the proposed uses: a business park with a focus on advanced manufacturing and research & development. This helps streamline the planning process for future developers, making the site more attractive for investment. The site has already attracted its first tenants in the form of two new national innovation centres; the National Manufacturing Institute Scotland (NMIS) and the Medicines Manufacturing Innovation Centre (MMIC) which will be the catalyst for the development of Scotland’s advanced manufacturing and life sciences sectors, providing support for businesses of all sizes and connecting all of Scotland’s engineering universities and colleges. Always good to end on a high; let’s hope we have more good news in a fortnight’s time.